THE FAMILY OF a black US motorist shot dead by a white police officer and the city of North Charleston, South Carolina, agreed to a settlement, the city’s mayor said. The city council voted to approve the $6.5 million settlement, Mayor Keith Summey said in a statement yesterday. 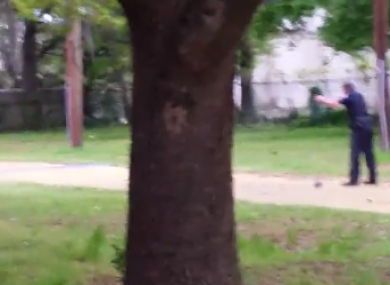 Walter Scott was shot in the back five times as he tried to run away from city police officer Patrolman Michael Slager on 4 April after being pulled over, reportedly for a broken brake light. Slager, 33, was charged with murder after a video emerged showing him firing eight times towards Scott. “This is a very difficult period for the Scott family. I know they are glad to have this part behind them so their healing process can continue,” the statement read. The death of Scott, who was 50 at the time of his death, set off protests in the city and followed a string of highly publicised incidents of police violence against African Americans around the country. “As a result of this tragedy, important issues have been discussed, not only in North Charleston, but around the country,” Summey said. He noted governments are becoming more responsive to citizens’ complaints, police departments are building tighter relationships with communities and, in North Charleston, police are starting to wear body cameras to record their interactions with citizens. Email “Family of black motorist shot by police in shocking video reaches pay settlement”. Feedback on “Family of black motorist shot by police in shocking video reaches pay settlement”.